Hummus is another item we make often. Versions of hummus first appeared in Cairo during the thirteenth century. It’s a dish that has definitely stood the test of time and now shows up on menus all around the world. A simple dish, hummus is a spread made from five basic ingredients: chickpeas, sesame seeds, olive oil, garlic and lemon. Place all of the above ingredients into a blender (or food processor) and blend until the chickpeas have turned into a paste and are well blended with the other ingredients. If you use a blender you will have to stop the blender to scrape down the sides a few times until the chickpeas are broken down into a paste. 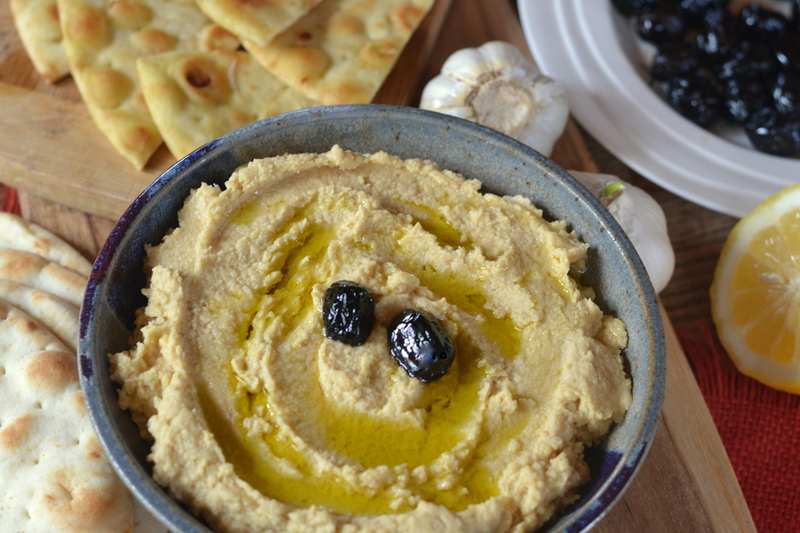 Place hummus in a bowl or on a platter, drizzle with olive oil and garnish with black olives. Serve with pita bread or as a dip beside fresh veggies.